Of all the areas of the face, jawline is the most common place to get acne – particularly in adults. Two kinds of acne, which are specific to adults, tend to strike in the jawline area. One is persistent acne, or acne that continues after the mid-20s and the other is adult-onset acne, which can hit even after years of clear skin. Both cause deep, inflamed pimples on the jaw, chin and near the mouth. 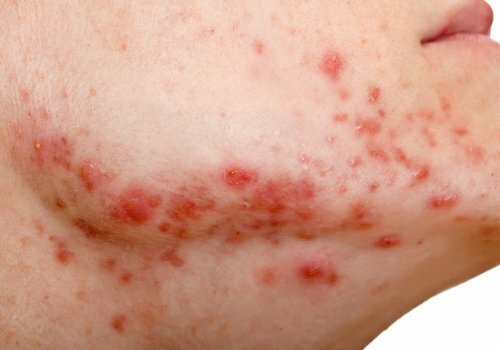 Both persistent and adult-onset acne are likely to affect women more than men. The reason for this is often due to hormonal shifts and imbalances in the body. Many women find they get chin breakouts monthly along with their cycle. The type of acne you get on the jawline often is not the same type of acne that you get on the rest of your face. The difficulty in treating these kinds of acne is that they don’t normally respond very actively to the usual drying spot treatments. As jawline breakouts are more likely to be cystic (bigger pimples deep under the skin), spot treatments will typically dry out the surface but still leave you with a pimple underneath. Also, since they are large and severe, they can persist for 1-2 weeks and leave behind red, dark scars, which hang on even longer. First we will explain to you about the causes of acne around jawline and then we will tell about the best jawline acne treatments to remove acne there from. The first step to treating jawline acne is to figure out what causes acne on the jawline? The type of mild to moderate acne, which usually occurs on the forehead and cheeks is a condition called acne vulgaris, or common acne. When it comes to acne on jawline, it’s usually acne mechanica, also known as irritation acne. In the US, the main cause amongst teens who get acne on the jawline are usually those who play football or march in band due to the straps they have to wear with helmets or straps that come with marching band hats for many hours a week. Wearing straps like this for hours a week combined with the sweat that occurs along with it, encourages all types of bacteria to grow within your skin pores. This is enough for formation of acne around jawline. And this is also bounteous breeding base for black and whiteheads to crop up as well if dead skin cells and oil unite together. You can also get acne along jawline due to braces and spacers placed on and between the teeth, since they end up stretching the skin tighter on the jawline. This leads to restricting your pores, preventing them from draining naturally. Consequently, dirt gets trapped and acne ensues. A correlation between jawline acne and smoking has also been observed. Thus acne around jawline seems to occur more frequently in teens and young adults who smoke. Smoking also makes blackheads and whiteheads more at home. Doctors have also observed that teenage girls and young women are more prone to breakouts on jawline, especially who use toothpaste and mouthwash containing the ingredient SLS, or sodium laurel sulfate (also known as sodium dodecyl sulphate outside of North America). How To Get Rid Of Jawline Acne? 1. Avoid Acne Aggravating Habits: Jawline acne in particular can be aggravated by some habits and medications. Shun the habit of resting your chin in your hand as it transmits dirt and bacteria from your hand onto your face. Combined with the warmth of your hand, this creates a perfect environment for bacterial growth leading to acne breakouts. Also, frequently touching your face with your hands transfers dirt and bacteria onto your face. Long hair also contributes to jawline acne. Hair, even if clean, contains oils that supplement to those of the skin. Cosmetics, particularly if left on overnight, may block skin pores and trigger acne breakout especially along the jawline as it is a sensitive area. Stress can incite production of the hormone androgen that leads to aggravation of acne. 2. Acne Mechanica – Acne Around Jawline: Preventing or curing jawline acne depends on what has caused it. Obviously, the first thing you can do is to reduce pressure on your jawline to prevent pimples occurring thereon. If you have to wear helmet as a safety precaution, find out opportunities to take it off whenever you can and clean off any sweat that may be sitting on your jawline and let the area air out. If you keep the jawline as loose as possible, the acne on jawline is less likely to breakout. Another crucial thing in treating acne mechanica is cleansing the skin whenever you get perspiring. If you can’t avoid sweat, you can at least rinse it away as soon as possible. When you rinse the skin, don’t try to rub your acne. But consider using a shower mitt to clean your skin every time you wash up after sweating, and then dab the acne skin dry instead of aggressively rubbing it like you might do the rest of your body. 3. Diet For Acne: Diet can also be a spoilsport for jawline acne. Most of us, especially those who eat a typical American diet, consume lot of fried and oily food. So try to reduce that as much as you can. It will not only help in treating your acne, but probably you will begin to feel better also. Secondly, avoid too much of refined sugars. They are responsible for many skin and health disorders. Take your acne problem as an excuse to drop those empty calories. If nothing else, this will help you ward off obesity and many other health afflictions. Thirdly, the skin works as an excretory system to get rid of substances that don’t agree with your body. In the case of dairy, it is a mucous-forming food and can be difficult for the body to digest— that is why many people are lactose intolerant. So when your body does not work efficiently to digest it, it can pop out in the form of cystic acne (hard, painful bumps under the skin) on the chin and jawline area. So consider cutting out all forms of dairy (yogurt, milk and all cheeses) for 2 weeks to see if any new breakouts appear. If not, this may be the cause. 4. What Products Are Best For Jawline Acne? : To remove jawline acne, you need to keep skin pores on the jawline cleaned. While choosing facial cleansers, remember two key ingredients – benoyl peroxide or salicylic acid. Preferably, look out for a product that contains both. If you can’t find such a product, buy two products in order to get the full benefit of both the ingredients. They work best to get into your skin pores and cleanse out all the junk that is inside them. Once they are cleared out, you will start seeing improvement, although it might take several weeks to provide full results, so be patient. Another fact you need to keep in mind is that the skin that covers your jawline dries out faster than that of the rest of your face. So, if a moisturizer can help to prevent whiteheads and blackheads on your forehead and the sides of your eyes, you probably need moisturizer on your jawline, too. 5. Prevent Breakouts On Jawline: At the outset, you should aim for preventing pimples on jawline from formation. For this you would need a quality non-drying, alcohol-free acne serum that contains salicylic acid. This ingredient is a keratolytic beta hydroxy (BHA) acid known for its property to get into the skin pore lining (far better than AHA’s like glycolic acid) and exterminate acne-causing bacteria. By using salicylic acid, you are really preventing the breakouts from potential occurrence. Although, different skin types respond differently, but a treatment such as this can be very helpful without drying out the skin or leaving it dry and flaky. The reason why a serum is very helpful is because it is formulated for use under a moisturizer at night and acts over the course of many hours to get deep into the pores. On the other hand if use a cleanser or mask with salicylic acid to cure acne, it’s just being rinsed off and it won’t be as helpful (although, it will help to get rid of superficial bacteria, which would be still beneficial). 6. Spot Treat Acne On Jawline – And Don’t Pick.The other important thing when treating chin acne is to treat the already formed acne as fast as possible when it triggers. It’s important to deal with your acne correctly once one pops up enough. Every step you take will determine how long both the acne and acne scar will last. There are many products that work well to treat jawline acne such as tea tree oil, which is an anti-viral and anti-bacterial natural agent that is more effective than the standard treatment of Benzoyl Peroxide, which can have some unpleasant side effects. Simply dilute tea tree oil with water then dip a cotton swab or ball into the mixture and dab along your jawline. Do this before you go to bed at least twice a week. 7. Consult A Good Dermatologist / Gynecologist: A potential reason for jawline acne breakout could be due to hormonal changes that may be happening in your body. More women tend to suffer from jawline acne than men do, because of enhanced testosterone levels and imbalanced hormones. The Testosterone leads to accumulation of proteins in the cells that line your pores. This process carries on until bacteria, pus and dead skin cells are formed inside, resulting into those nasty pimples that you see along your jawline. Also it can happen if you’re on birth control pills and they may need some adjustment or maybe you’re peri-menopausal and your hormones are botching up. Gynecologists are experts on the subject of hormonal fluctuations and their effects on the skin and he or she may have some helpful suggestions. Also, If you observe increased hair growth on your chin, you may very well be suffering from hormonal acne. If such is a case with you, you need to consult a god dermatologist or doctor. Now that you are aware of the different causes and treatments for jawline acne, you can simply follow the above-mentioned jawline acne treatment tips and have a clearer and healthier skin.